There seems to be a general improvement in the quality of gluten-free bread products being offered at restaurants lately. When I first started following a gluten-free diet, the sandwiches I’d get at restaurants were quite disappointing. The bread or bun didn’t hold together well at all. More recently, I’ve had much more satisfactory experiences. The hamburgers at several restaurants have been served on buns that hold together very well. A few weeks ago, we had dinner at Max and Benny’s in Northbrook. They don’t have an extensive gluten-free menu, but they do provide sandwiches on gluten-free bread, chicken soup with gluten-free noodles, and a selection of other menu items. 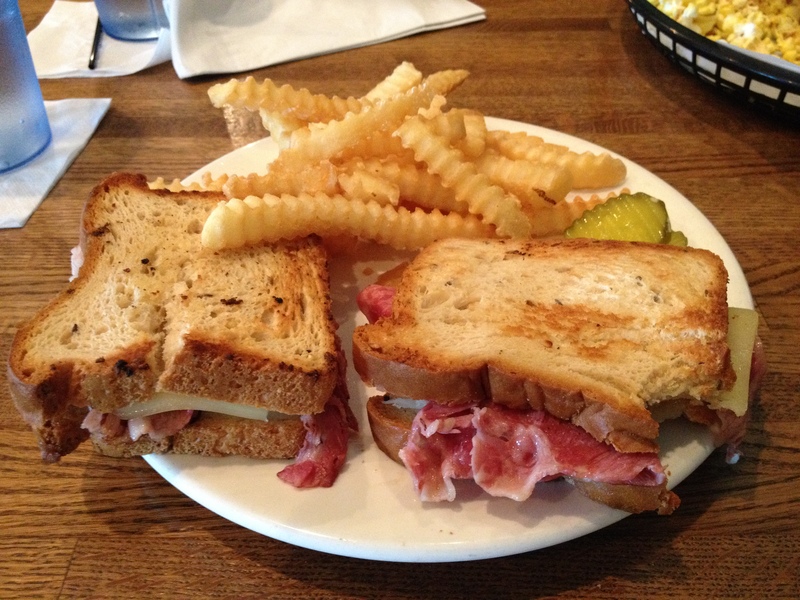 I had the corned beef sandwich – I had ordered one on a previous visit – and I found the quality of the bread much improved this time. I was able to really enjoy eating the sandwich. In general, there is a much-improved availability of gluten-free products – in grocery stores, restaurants, and online. Not only are there more options, but the quality of the products seems to be improving. I do still wonder why broad noodles are missing from most sources. Besides the bloggers I follow, I have subscribed to the King Arthur website, and my inbox frequently provides me with tempting recipes. Watch this blog for my upcoming comments on the gluten-free offerings in our grocery stores. This entry was posted in Restaurant Review and tagged gluten free, gluten free restaurants, gluten-free bread, gluten-free bread products, King Arthur, Max and Benny's, Northbrook on July 18, 2014 by goforsix. A few days ago, I participated in a lunch meeting. 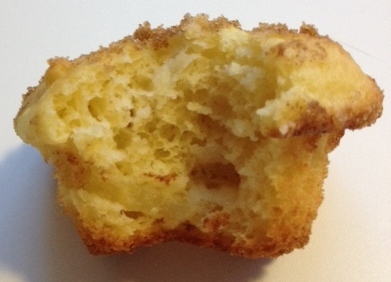 One of my friends brought muffins from a gluten-free mix she’s discovered. (She’s not gluten free, just a good person that goes out of her way to do good things for friends.) It is the King Arthur gluten free muffin mix, and is very good with chopped apple mixed in with the batter, and topped with a mixture of sugar and cinnamon. 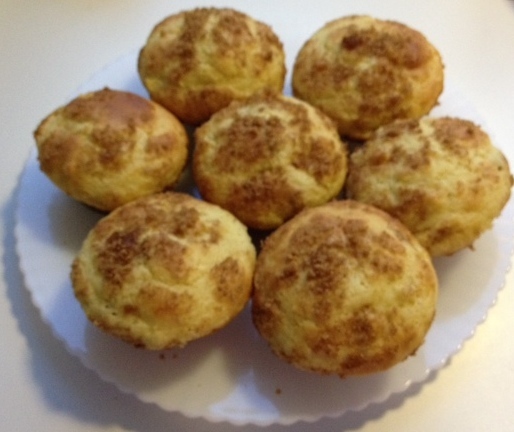 Since my friend introduced me to these muffins a few months ago, I have made them several times. They have wonderful taste, texture and are quite moist. They don’t fall apart as you eat them, as so many gluten free products do. I have tried using raisins instead of the apples, but the apples do a much better job of infusing flavor into the muffins, and I believe help keep them more moist. Another option would be to use brown sugar instead of white sugar when mixing with cinnamon for the topping. People who are not gluten free will also enjoy them. Give them a try – they’re excellent. This entry was posted in Prepared foods and tagged GF muffins, King Arthur, mix, moist on February 19, 2014 by goforsix.